‘Pele’ means ‘black diamond’ in Portuguese, the national language of Brazil and the man ‘Pele’ justly declared to be the national treasure of that nation. But as the movie reveals, the name ‘Pele’ was actually a kind of racist slur on his black colour- a slur by his white master’s son, for his mother worked as a servant in the house of a white man. That is how Pele grew up; facing challenges of poverty, racism and the high crime rate of Brazil. He and his friends (most of them blacks) grew up in slums and had to steal peanuts in order to get proper shoes for playing football on equal terms with the team of white boys including his white master’s son- but the shoes didn’t work and they decided to play shoeless anyway; and ‘shoeless ones’ was their team’s name. But he lost his best friend when the men whom they stole peanuts from chased them and his friend got buried in a swamp. So he was no stranger to tragedy. But his father (a former footballer who was deeply affected when Brazil lost the 1950 world cup match) helped him hone his skills by patiently giving him tips on how to play; and he wanted his son to escape the drudgery of the menial work of cleaning toilets that he himself did. The son’s skills drew the attention of an important football selector who decided to send Dico (Pele’s real name) to a proper football camp for real training . In the football camp Dico realised that his way of playing football was frowned upon by the higher authorities and the coach (all whites) as being primitive and as the cause of Brazil’s defeat in the 1950 world cup. And for a nation in which football is religion, the defeat stung like nothing else. So what was Pele’s version of playing football? It was known as ‘ginga’, a martial art, that had been developed by African slaves who had escaped into the jungles centuries ago. The whites in higher positions may frown upon it but it is what is the unique quality of Brazil’s game- the way which has made Brazil’s football playing so different and flamboyant. So will the higher authorities realize that ‘ginga’ is the Brazilian way of playing football and playing it is the way Brazil is going to achieve success? But to realize that, the whites have to get it out of their heads that they are no longer Europeans that they think themselves to be. They are Brazilians and their destinies are tied with that land. And watching that happen is an emotional journey in itself, something that made the experience of making this movie so special. For the higher ups are made to realize the truth in a non-confrontational manner- the Brazilian way. Brazil is the country where racism has been tackled without major problems between the races and the movie shows how the white members of the team finally integrate with the non whites without any major confrontation erupting out. And this integration results in a world cup winning performance, the star of which is the ‘black diamond’ i.e. Pele. He is just sixteen when he is selected in the team and does not even play the first few matches of the 1958 world cup as he is ruled out by injury. But when he does play, it’s sheer magic. If football played poetry, then Pele would be the finest poet. And Brazil goes on to win the next world cup too in 1962 and again in 1970. The world celebrates the Brazilian way of playing football as the ‘beautiful game’. 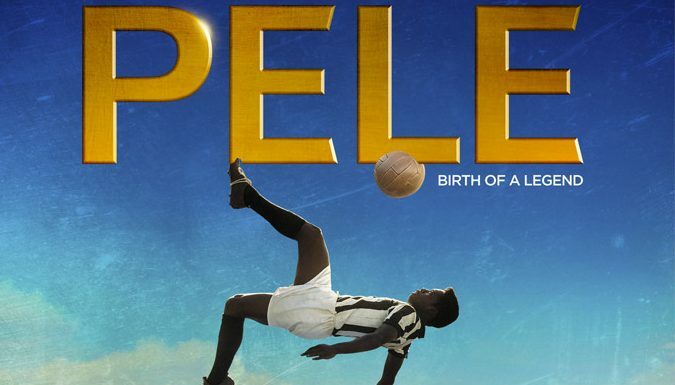 I particularly liked the flow of the film, which showed Pele’s story in an understated manner without any major drama erupting out. It is only on the football field that Pele and his game creates drama- a drama that has the world enthralled. Acting by everyone is satisfactory and the music is appropriate for the situations. The film has some sentimental moments like Pele’s parents’ joy when he is selected for the national team and the joy that erupts in Brazil after winning the world cup. The highbrow critics have not liked the movie, but who cares! The common people like us will like it. That’s the way Pele, a common man who came from the underclass himself, would have preferred it to be.